International Customers: Please contact sales@radiumauto.com for a shipping quote on fuel cells. This complete system combines a competition-grade fuel cell with Radium's innovative Fuel Cell Surge Tank. The fuel cell comes fully assembled and pressure tested. 1. Select the fuel cell bladder type and cell gallon size, see information below about the different bladders. 2. Configure the surge tank. 3. Pick optional accessories (fill neck, level sender, etc). Compatible with all types of fuel (including popular alcohol blends such as ethanol). They feature a molded plastic bladder for those that are looking for a cost efficient cell and do not require a certified bladder. More information HERE. Identical to the Race Safe Fuel Cells (listed above) except FIA certified. More information HERE. Compatible with hydrocarbon fuels only (gasoline, diesel, AV gas). They feature a durable lightweight coated fabric bladder design. More information HERE. Compatible with all hydrocarbon fuels (gasoline, diesel, AV gas) and alcohol blends up to E85. They feature a coated fabric bladder and are approved for use in all motorsports. More information HERE. Compatible with all types of fuel (including popular alcohol blends such as ethanol). They feature a soft extremely conformable high strength lightweight coated fabric bladder. More information HERE. For information regarding the FCST go HERE. 3. This product IS NOT compatible with quick fill dry-break systems. Contact info@radiumauto.com if a quick fill system is needed. 5. 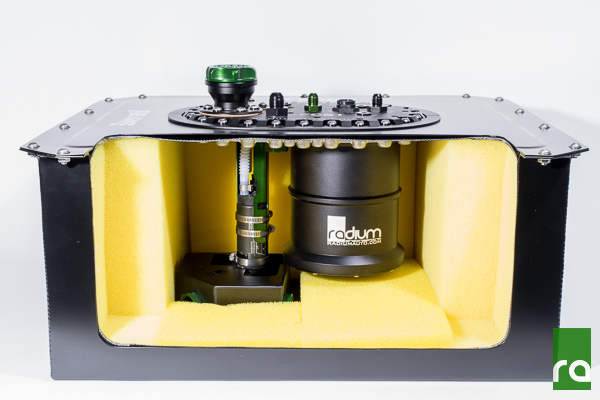 RADIUM DOES NOT OFFER A WARRANTY ON ANY FUEL PUMPS! FUEL PUMPS CAN BE RETURNED IN UNUSED CONDITION WITHIN 30 DAYS OF PURCHASE. SEE TERMS AND CONDITIONS FOR MORE INFORMATION.